With regard to stay invested: Well, although I agree with O’S in his basic assumptions, I do not draw the conclusion from what O’S writes, or rather: what you conclued, that you should not try to “time” the market. He only says that one should persue one strategy and stick to that – within the equity part of the portfolio. But why not reduce the equity part and increase cash, when the whole market is overpriced? “What works on Wall Street” is all about RELATIVE valuations – relatively cheap is relative better than relatively expensive. That does not mean, that you should buy the relatively cheap stocks, when all stocks are expensive! 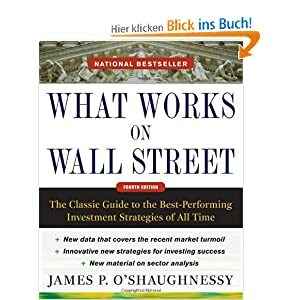 I also do not fully agree, that you necessarily always have to stick to the same strategy – for exampe, you can and should ignore RS after a market crash. You will find the most intersting stocks among those who suffered from the greatest declines. You can also ignore the p/e ratio, since otherwise, you will select defensive stocks, and not the more interesting depressed cyclical stocks. I agree with your second conclusion: I do not believe, that it is necessary to pursue a strategy exactly in the way that O’S tested it. I think one can look “behind the spirit” of the strategies – and this is, generally said, to buy cheap stocks (and a positive medium term RS), and to ignore margins and so on, and maybe watch some red flags. Yes, that’s also the most important thing for me! It is not SO much important, which single strategy worked best, because I also would not rely on one single valuation metric. In the third edition, there was some hint, that combining the strategies improves the result, but I am really happy, that he now tested the rank-sum, and that this strategy is effectively the best over all (only four microcap strategies had a better compund return, all of them with a small number of selected stocks, 10-50, which indicates, that it could be just chance, and three of them are based on the p/b). Unfortunately and surprisingly, the compound return of the value composites was only about 1 percent better than the best single strategies (e.g. EV/EBITDA), but with a much higher consistency and with the worst decile performing with a negative return! Together with the relative strenght, you get around 9 percent outperformance vs. the “All Stocks” universe (or even more vs. the S&P500, over 10%). Even if the overall stock market won’t perform with 9-11% p.a. from now on (the real return was significantly lower, of course) – is it really awarding to ignore the statistics, when you earn 5-6% + 10% with such a strategy, or rather: can one afford to ignore it? no, one should definitely not ignore it. Howver, I still refuse to go for “fully automated”. I think one of the big lessons is to stay invested. Secondly you should buy stocks which are generally cheap. thirdly you should not catch falling knifes. The third part is the hardest for me. thanks for the comment. As you know, I am a “newbie” with regard to this. I still like the combined criteria as well as the accounting criteia. This might make a good screener. I also always had my difficulties with price momentum, but I solved this conundrum: This is no contradiction to an anticyclical approach, in fact, it even does confirm this approach. It only means, that a trend lasts over a certain time (in the medium term). So in the shorter time frames, you actually will see that momentum works. The ideal time frame is 6-7 months, it also works for 1 year, but with two years, the outperformance disappears. And remember, the holding period is just one year! Whereas over the past five years, a bad relative strenght is better! The price-to-book also works over the whole time period, and also for the first decile, but not only is the outperformance rather small, it is not consistent, not just within the deciles, but also over time. That really came like a bombshell. The debt ratio does also not work, but maybe in conjunction? At least it seems, that the p/b still adds value in a combined strategy. The P/S made sense to me, because besides wholesale stocks, you always get stocks with a very low P/S relative to their sector – and the P/S works also within one industry sector; so the average of that should work (and it still does, it still adds value!). I’m sure, in the next edition, there will be different single strategy which worked best. In Richard Tortoriellos book, it was the P/FCF ratio. Assuming that no taxes are deducted to reduce the yield metrics, why would share buy backs perform much better than reinvested dividends? It is possible that decreasing floats contribute disproportionately to increase valuation metrics. I know that screening for low float, high institutional and insider ownership metrics is an old trick in the bag of momentum investors.Low float (though not illiquid) could be interesting metric to test for. An other explanation would be that investors typically use dividend proceeds for other purposes than to reinvest in stocks, like discretionary spending or investing in fixed income. This would mean that the temptation of using dividends to suplement income is a pretty big value destroyer if it means that you’ll be compounding at 3% less over many years.